We believe that quality protein should be the main ingredient in the bag. 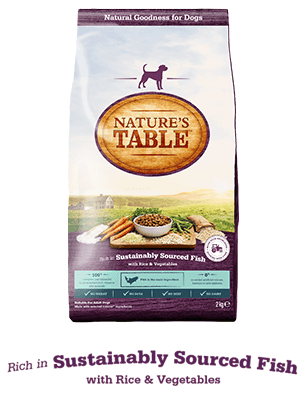 The meat protein or fish in each of our Nature’s Table™ recipes is free from anything artificial. 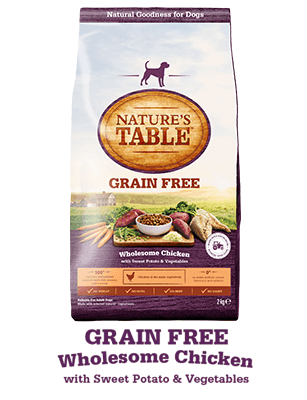 In addition the fish we use comes from a certified MSC source, so you can be confident it’s not only good for your dog but good for the environment too. Our team of nutritional experts use the latest thinking from veterinarians to develop recipes that contain all the macro-nutrients, vitamins and minerals a dog needs. As you would expect, all our recipes conform to legislation which cover the production of pet food and we meet if not exceed the 'good practice' guidance issued by the European Pet Food Industry association (FEDIAF) including the guidance about Natural pet foods. To ensure our foods taste delicious, we source our specific ingredients with care. This means being confident they are free from added artificial colours and flavours and they are prepared in a clean and safe environment. We pay a fair price and make sure a steady supply of our ingredients can be guaranteed to keep each recipe consistent.